Bridge of Spies, which follows Tom Hanks as James Donovan representing accused Soviet spy Rudolf Abel (played excellently by Mark Rylance, who should get a lot more screen time in future films) amidst the Cold War, is a lush, rich, visual feast. Light blooms from every source, America is pristine and sharp in vintage 50s set pieces, and, when it enters the film past the halfway point, East Berlin looks bitterly cold. It’s hard to say this is one of Spielberg’s most beautiful films given his deep portfolio to choose from, but it certainly stands up to any of the others and is an excellent addition to the filmmaker’s record. Alongside Rylance, Tom Hanks, playing the lead, is phenomenal. When the film centers around his character, he and the film both are captivating. I could barely take my eyes off Hanks and his measured portrayal which displayed the kind of quiet strength other actors are certainly unsuited for. Indeed, this may be one of Hanks’ best performances to date. Tom Hanks has always been used as the Guy Who Is Quiet or the Guy Who Doesn’t Speak Well. For proof, just look to Castaway, Forrest Gump, Saving Private Ryan, and The Terminal. In all of those films, Hanks captures the audience without having to be a charismatic dynamo. 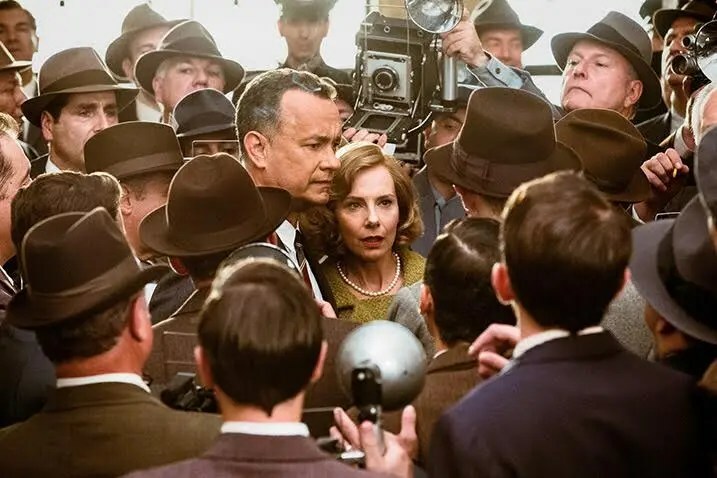 In Bridge of Spies, he certainly speaks quite a bit (his character is a negotiator, after all), but it is the experience from these other parts which allows him to convey much more than the lines given to him in the script. East Berlin. Don’t vacation there. Hanks is so good that the film struggles to stay together when he isn’t on screen. As Spielberg attempts to add more spinning plates to the performance further on in the film, I found myself disinterested and a little annoyed. For instance, an American student is captured in East Berlin and, without giving anything away, Spielberg frustratingly devotes a few minutes to his girlfriend, whose story impacts the rest of the film in no way at all. Luckily, though, a vast majority of the film follows Hanks and his character’s struggle. Thematically, Bridge of Spies nuzzles in nicely alongside other Spielberg films. It is, at its core, the story of a man fighting against the many societal systems in place which hinder true heroism and goodness. Spielberg makes most of his films with this theme in mind, but in Bridge of Spies, he tackles it so broadly, he disservices the film. It’s tempting to compare Bridge of Spies with Saving Private Ryan. For one, they both star Tom Hanks. But even more, Hanks plays a guy fighting against the myriad forces and organizations which prevent him from nobler pursuits. In Saving Private Ryan, Hanks is a commander just trying to do his best to lead his men, while dreaming of the day he can return to his school teacher life. Sadly for him, those nasty, evil Germans have started a war and America has to fight them. Even worse, America is making him march across battlefield after battlefield to find this Private Ryan guy. Hanks’ Captain Miller tries to keep his soldiers focused on their own humanity while they see so much of it lost along the way. In Bridge of Spies, Hanks is again forced to do something he doesn’t want to do (and again by America!) and he again is the guy on the side of nobility while the government plays the foil, trying to deny due process and rights to the suspected Soviet spy. In fact, Spielberg stacks the odds so high against Hanks’ character (a judge, the CIA, and dammit, even the citizenry themselves want to see this spy killed and killed quickly!) that it would be amazing to even think due process exists in a Spielbergian America. But America isn’t the only organization that plays the foil. Spielberg adds more and more to the film as it goes on, rendering these nebulous groups as one-dimensional villains. The American justice system bears no resemblance to its real-life counterpart, the CIA steadfastly pursues its agenda without a thought to heroism, goodness, or justice, and the American citizenry blandly reacts to whatever is on the front page of the newspaper. The Soviets are presented as counterparts to America; they are Russian-speaking clones with their own kangaroo courts and feats of espionage. It is East Germany which gets the true short end of the stick (as much as failed Communist governments can be given a short stick). In a completely incongruous scene for the movie, their bureaucracy is quickly painted as a bumbling, barking, but toothless terrier to the Soviets’ role of handler. Never do the East Germans at all seem formidable. Each threat they make comes off sounding petty and their one true power play against Hanks in the film doesn’t intimidate him in the slightest. With various aspects of America, the Soviet Union and East Germany to lampoon, you’d think Spielberg would have enough bad guys (or bad groups?) in this film, but he also throws in the 1950s American family into the fray, portraying Donovan’s wife (a game Amy Ryan) as a shrewish, needling woman and his kids as mere intrusions on Donovan’s otherwise noble life. (Donovan meddles in his teenage daughter’s love life because, you know, dad stuff.) When Donovan is told that his mission is secret and that he can’t tell his family, you almost want to jump for joy with him. Why in the world would someone, in the pursuit of all that is good in this world, work for a government or have a family? Spielberg certainly seems to suggest that these things are not compatible. It’s not that Spielberg can’t make a film about the struggle of one man against the various systemic forces holding him back. It’s that Spielberg almost always makes this film. Take Lincoln, which humanized the Civil War icon and portrayed him above the political machine in which he worked. Or The Terminal. It is a story about a man who is literally trapped by the social constructs he finds himself forced to deal with. Schindler’s List is about one man, a German, who shows that humanity exists outside of these flawed societal arrangements we humans create. Saving Private Ryan is similar; it is a tale of a group of men who, individually, are noble and heroic and willing to help each other, but who are caught amidst rival governments waging war on each other. Heck, even Jurassic Park attempts to show what heroism individuals are capable of when separated from the social systems that organize them. E.T. and Jaws play with similar ideas. Spielberg, as all great filmmakers do, uses film to illuminate truths in our lives. And indeed, the many facets of society we surround ourselves with (jobs, families, governments, armies) do often cause problems which we as individuals probably would never create (war, dinosaur theme parks). And there is certainly no problem in making films about these things. Bridge of Spies suffers a bit under Spielberg’s paint brush, though. In the rush to throw enough responsibility for varying failures around, the characterization of governments, employers, the justice system and families is trodden over. The targets of Spielberg’s attacks become unrecognizable. The American government that Jim Donovan battles against is not our American government. The kind of family which does not support him isn’t our kind of family. The people he lives amongst aren’t our people. And so, while Bridge of Spies is beautiful, it’s message is only skin deep.